Today, Bugatti is celebrating the reopening of its London showroom. The address in Mayfair which has been established for several years has now taken on a new shine. Bugatti’s long-term partner in the United Kingdom, H.R. Owen Bugatti, has had the showroom, which is exclusively devoted to the French luxury brand from Alsace for the first time, completed in the new Bugatti brand design. This is the first dedicated Bugatti showroom to be opened in the UK and will be the only place in the UK to view and order the new Bugatti Chiron. The showroom is located on Bruton Street in Mayfair, adjacent to H.R. Owen’s famous Bentley dealership – Jack Barclay and other dealerships of the company and delivers the perfect environment in which to view the new Bugatti and discuss personalisation options with the factory trained team. It allows customers a private and secluded buying experience, out of view from the outside world, and allows them to get up close with the car. The showroom features the very latest Bugatti branding, with the legendary Bugatti blue playing a prominent part in the modern and clean styling around the room. H.R. Owen Bugatti is furnished with items from the recently launched Bugatti Home Collection. The specially designed armchairs are made using the finest leather and blue carbon fibre, the same high-spec materials that feature in Bugatti’s cars. As well as the present and future, the showroom will also reflect Bugatti’s history and heritage, with a selection of art installations and sculptures that celebrate the brand beyond the cars. H.R. Owen Bugatti is more than just a car showroom, and is designed to convey a shared passion for the Bugatti brand and everything it stands for. The launch of the new showroom is an important moment for both Bugatti and H.R. Owen, with senior figures from both companies present at the official opening. Dr Stefan Brungs, Member of the Board of Bugatti Automobiles S.A.S. for Sales, Marketing and Customer Service, and Anita Krizsan, H.R. Owen Bugatti Brand Director, cut the ribbon to inaugurate the new dealership. Bugatti Automobiles S.A.S. is the manufacturer of the world’s most powerful, fastest, most exclusive and most luxurious production super sports car. Since it was established in 1909, the French luxury brand has had its headquarters at Molsheim, Alsace, where 450 Veyrons were produced from 2005 to 2015 and the new Chiron, which is to appear in a series limited to 500 cars, is to be hand-crafted from the autumn of 2016. More than 200 customers have already ordered their Chiron. The brand, which has been part of the Volkswagen Group since 1998, employs nearly 270 people. With 32 dealers and service partners in 17 countries in Europe, North America and the Middle and Far East, Bugatti is now a global player. H.R. Owen is Britain’s leading luxury motor dealer group, dealing with some of the world’s most sought-after premium car brands. The H.R. Owen Group not only operates in sales and service of premium luxury cars, but it also offers a number of related divisions across all brands including Chauffeur Drive, Insurance Services, Classic Cars and Luxury Hire. The H.R. Owen flagship dealership, Jack Barclay, has been operating in Mayfair since 1927 and although traditionally just a London-based business, the company now has locations in five counties in addition to their six London showrooms – Cheltenham (Gloucestershire), Pangbourne (Berkshire), Byfleet (Surrey), St. Albans (Hertfordshire) as well as Stockport (Greater Manchester). 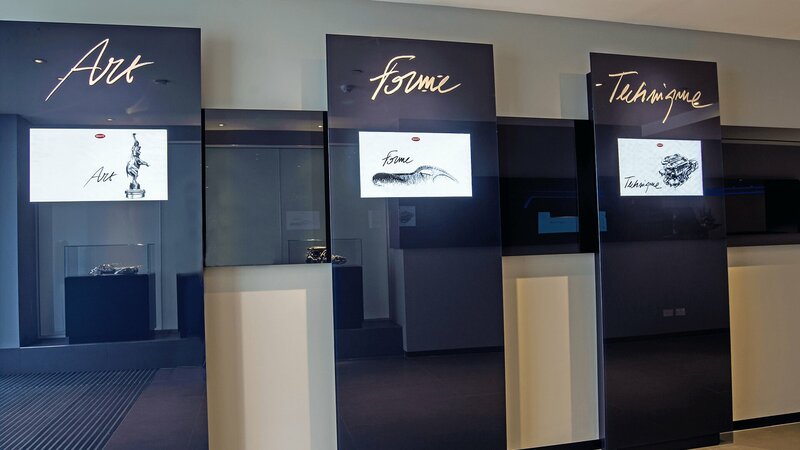 Three wall-mounted pillars are devoted to Bugatti’s brand values “Art Forme Technique”, illustrating them with films and animations. H.R. Owen Bugatti is furnished with items from the recently launched Bugatti Home Collection. The specially designed armchairs are made using the finest leather and blue carbon fibre, the same high-spec materials that feature in Bugatti’s cars.